Today, after more than a year of national debate, the Open Internet Order goes into effect. The Order keeps the Internet an open and democratic space free from undue corporate control. Business leaders, start-up innovators, and economists widely praise the Order as win for the economic growth. But protecting the open Internet is not just sound policy — it’s a moral imperative. Today, I join twelve of America’s top faith and moral leaders – Christian, Jewish, Muslim, Sikh, and Humanist – to celebrate the Open Internet Order as necessary for our work and the communities we serve. Even as the Order becomes law, major carriers are attacking it in Congress and the courts. That’s why today, we are calling on people of all faiths and beliefs to tweet, post, and share your support of the #OpenInternet. 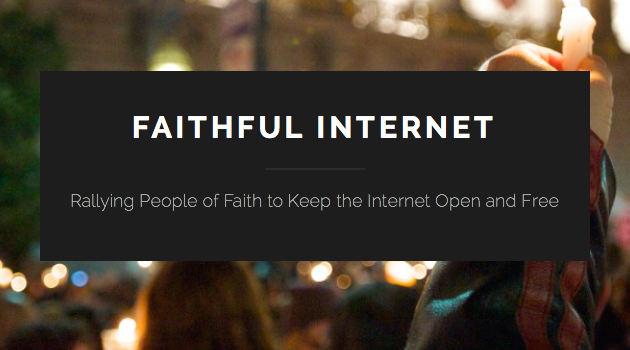 The future of faith in America depends on the open Internet. Traditional religious practice is reportedly on the decline, but faithful life in America is not waning; it’s evolving. Americans are increasingly seeking meaning, community, spiritual connection, and social action online. In response, today’s moral leaders are using the Internet to meet the needs of new generations, speak truth to power, and minister to the underserved. They are using online tools to help us hear the call of wisdom traditions, not to violence and exclusion, but to love and service. Thanks to millions of people who called on the Federal Communications Commission (FCC) to defend Internet freedom last year, the Open Internet Order was adopted. It codifies the principles that have kept the Internet an open space since its inception. It bans carriers like Comcast and AT&T from blocking or slowing down websites at will, or charging sites fees to create fast and slow lanes online. That means that faith groups, educators, artists, activists, entrepreneurs, and the rest of us will not have to worry about paying extra fees for the chance to reach people online. Nor will we need to fear whether carriers will shut down our sites because they disagree with our views. The Open Internet Order has already been praised as one of the greatest public interest victories in U.S. history. Yet major carriers are pressuring members of Congress to roll back the historic victory. This week, House Republicans have proposed a bill that would threaten to undo the Order through the back door. The appropriations bill contains provisions that would strip the FCC of the ability to enforce the Order. America’s faith and moral voices have always been at the forefront of social movements. Media justice is the next frontier. It’s what makes all other movements possible. If we take a stand now, we can protect this vital tool for generations to come. To learn more, visit Faithful Internet.